Update 28th February 2011 – Sidecar Issue Resolved? Right To Ride and our supporters have been following the unfolding events from Brussels regarding the latest raft of regulation proposals to come out from the EU Commission. These include new rules for emissions, ABS (Advanced Braking Systems), AHO (Automatic Headlights On), mandatory OBD (On Board Diagnostics), anti-tampering measures and so forth. Within the proposals are also limitations for small series manufacturers which for motorcycling will have dire consequences. The proposals aim to reduce small series motorcycle manufacturers from the present limits of 200 per annum down to 50 per annum, so for small companies like Norton, Harris and CCM, this will have devastating consequences. At Right to Ride we have an interest in sidecars – hacks – rigs – combinations – whatever their definition, because we have three bikes: our “normal” bike, a scooter and a sidecar combination. Sidecar combinations are challenging and fun in their own unique way, they are practical and impracticable at the same time, they range from the “amateur” built (to a professional standard) to the “professional” built, to being fitted by their owners or the sidecar manufacturer. With thousands of others across Europe, either individuals or those formed into clubs and national associations, we fully understand the reasons for owning a sidecar and for us it makes complete sense! However that sense looks like coming to an end with the proposals contained in the EU Commission’s Framework Regulations. We have been following these proposals for “motorcycles”, through our correspondence with DG Enterprise and Industry and attending the ACEM (the motorcycle industry representative in Europe) conference in Brussels. What we have found is that hidden within these proposed limits for motorcycles there is also a reduction of sidecar production (identified as L4e vehicles) from 200 to 100 per annum per company and also proposals for Type Approval. In our correspondence with DG Enterprise and Industry we tried to understand 1) their definition of L4e vehicles and 2) the implications for sidecar manufacturers. 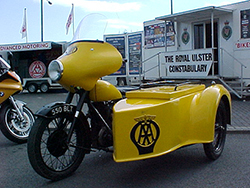 What has been revealed is that the Commission seems to have mixed up the combination of L4e vehicles (motorcycle and sidecar) with stand alone sidecars (defined by the Commission as a Separate Technical Unit – aka STU). “Assembly of motorcycle and side car will require type approval based on the requirements set out in our proposal and in the delegated and implementing acts that we are currently drafting. Type approval legislation only applies to new vehicles”. “Setting requirements for used vehicles and vehicles in circulation is the responsibility of Member States and falls out of the scope of EU type approval legislation. In case a manufacturer produces new side cars then these are regarded as Separate Technical Units (STUs). STUs fall within the scope of approval legislation and the applicable requirements shall be fulfilled by its manufacturer. 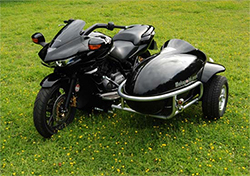 Once the side car is shipped to a workshop or to an individual who assembles retroactively the sidecar to the driving motorcycle, this assembly is subject to whole vehicle type approval requirements in case the driving motorcycle falls in the definition of a new vehicle”. In plain English this means that a sidecar is not a vehicle, it is a separate technical unit. “Annex III, small series applies to L4e vehicles, motorcycles with side car, independent if the side car was retrofitted or if it is fully integrated with the driving vehicle on the production line”. “If for example the company you are referring to sells, registers or enters into service less than 100 approved vehicles on the Union market in a given year the approval authority may, if it has reasonable grounds to do so, waive one or more of the provisions of one or more of the acts listed in Annex II, provided that it specifies alternative requirements. Alternative requirements shall ensure a level of functional safety and environmental protection which is equivalent as far as possible to that provided for by the relevant act or acts listed in Annex II of the proposal. Therefore the reply to your question is: no, it does not exclude manufacturers of sidecars. In the contrary, the limit was even doubled in comparison to 2-wheel motorcycles only in order to allow small and medium companies producing sidecars to benefit from special arrangements related to small series”. 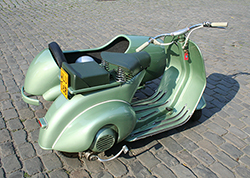 This means that although the Commission representatives recognise that a sidecar is not a vehicle, they still want to halve production and suggest that really, they are being generous to sidecar manufacturers compared to small series motorcycle manufacturers. There is no apparent safety or environmental reason for them to do this. The explanation we were given is that these limits are proportionate to small series cars manufacturers. The other reason given is that because certain people and companies flaunt the law and import vehicles, then get them type approved as small series, bona fide European small series motorcycle and sidecar manufacturers must be punished. More importantly, it seems that the people within the Commission are confused between the vehicle (L4e) i.e. a motorcycle and sidecar combination and a separate technical unit – which is the sidecar on its own. In fact our contact within the Department for Transport writes that his understanding is that small series does not apply if sidecars are being sold on their own as there is no category for them within the Regulation. Provided they are then fitted post registration (of the motorcycle), then national rules apply. The motorcycle industry is not interested in sidecar production, in spite of the fact that as many as (if not more than) 4,000 of these STUs are produced annually in Europe at a (conservative) estimated value of 20 million euros in sales, so it looks like sidecar manufacturers are on their own. 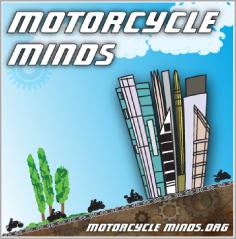 Together with Rod Young of Motopodd Ltd, a manufacturer of sidecars in the UK, we’ve written to Wim van de Camp, MEP and rapporteur of the Internal Market and Consumer Protection Committee to express our dismay at this short-sighted proposal. We have requested that within the amendments that the Internal Market and Consumer Protection Committee (IMCO) put forward on 28th February at their meeting, sidecars are either removed from the limits proposed or at least left at the status quo. 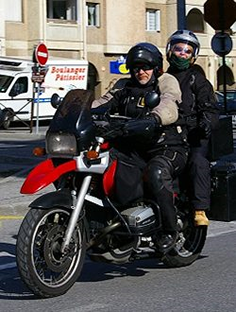 For those keen enough to find out about the future of motorcycling in Europe, there is a meeting of the IMCO on Feb 28th at 16.45 – you can watch it live. Note the time is 15.45 GMT – our time! Approval and market surveillance of two- or three-wheel vehicles and quadricycles – Presentation of Working Document. Click Here – Click on the right hand side link. In our conversations with the European Commission we sent the following “note” regarding the variety of sidecars and their use. The first is of course very humourous and shows that there are many types of STUs (Separate Technical Unit) which can be attached to a motorcycle – even pianos. The second example is far more serious. This is an example of the type of sidecars that are produced for the benefit of sick isolated people in the Sudan and in other third world countries and are a cheap and effective means of saving lives especially in these rural areas. The third link is to the website of a Minister of Religion who runs a funeral service and his sidecar is a hearse – actually he has three, he’s a busy man. 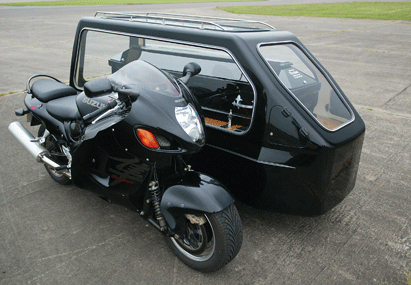 While his hearse is for all intents and purposes, a sidecar, his vehicles (which would seem to be considered as L4e vehicles) are registered in the UK as light commercial vehicles. 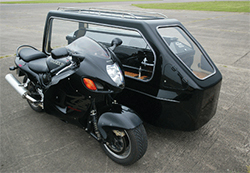 While I expect that the production of sidecar hearses would be unlikely to reach more than a certain limit, they do however reach all the required specifications of the Vehicle Certification Agency here in the UK and provide employment, not only for the manufacturers of these STUs, but business for Rev. Sinclair and others like him. The point here is, while I understand that it is a necessary requirement to have type approval even for STUs, there are a wide variety of types of sidecars (STUs) and the implications of limiting production of these STUs (sidecars) will have devastating effects on the sidecar industry directly and of course indirectly it would have even wider implications. For example, if the production of sidecar ambulances for poor countries is halved because of the limitation of small series manufacturers, this would reduce the possibility of saving lives. With regards to the final slide of Mr Jean’s presentation at the ACEM conference which stated, “We come into the world head first and leave feet first (NB: even in a motorcycle sidecar hearse), in between is all about balance”. 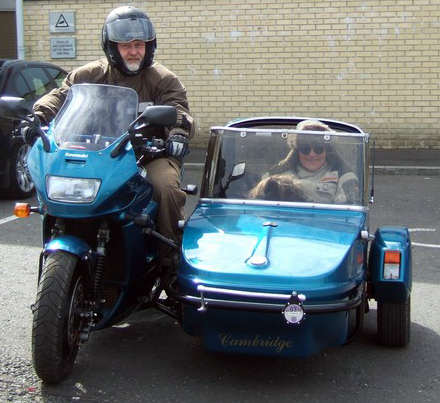 Would it be possible to re-visit the limitations for sidecar manufacturers – in consideration of the fact that they are not a vehicle and as there are an enormous variety of sidecars and their uses, perhaps this specific STU could be excluded? 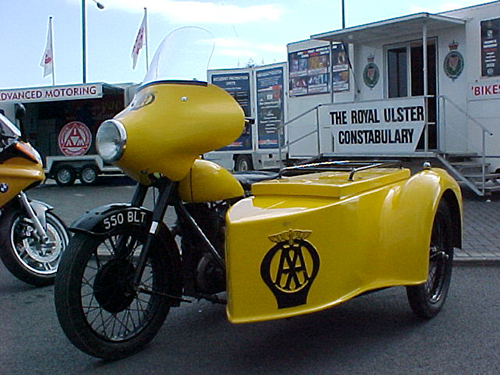 I note that in the TRL study (L Category Vehicles: Powertrain tampering prevention and Durability) for example, L4e vehicles are excluded, so it appears that by implication these vehicles are not considered a problem (in fact in terms of safety the frequency of motorcycle sidecar casualties are rare). I refer to the comment ‘Harmless’ modifications – e.g. those with no adverse effects on safety or the environment will not fall under the scope of possible anti-tampering measures’ on slide 4 of the TRL presentation. For those keen enough to find out about the future of motorcycling in Europe, there is a meeting of the IMCO on Feb 28th at 16.45 – you can watch it live. Note the time is 15.45 GMT – our time! http://www.europarl.europa.eu/activities/committees/homeCom.do?body=IMCO – Click on the right hand side link.